This Magician performs 1st class sleight of hand magic, has astounding pick-pocketing skills, and is guaranteed to get your guests laughing at any social event. 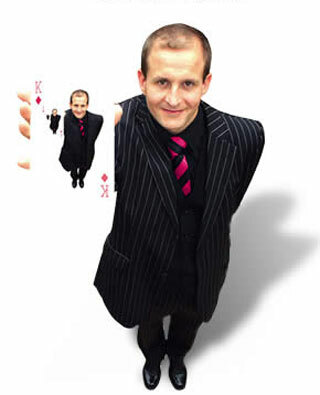 If you want to guarantee the exceptional entertainment of your guests with a mix of magic, pickpocketing and wit, he will bring a lot of laughter to your event, and help ensure it is one that your guests will remember. He is a full-time professional close-up magician and pickpocket. He will entertain your guests with amazing sleight of hand magic, surprise them with his unique pickpocketing skills (he can even steal someone’s tie and put it on himself without them knowing! ), and – he is guaranteed to get everyone laughing as he does it. From an intimate private function to a corporate audience of hundreds, you can be certain that the entertainment of your guests is in good hands. 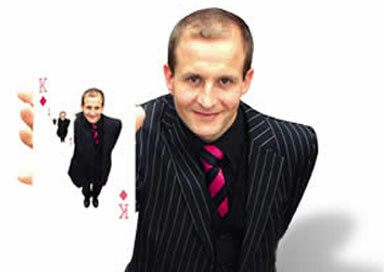 He has appeared on TV in the UK and abroad, performed for Royalty, celebrities, premiership footballers and top businessmen, been flown to events in Monte Carlo, Dubai, Qatar, Hong Kong, Istanbul, Berlin, Jersey, Le Touquet etc., entertained aboard cruise ships and at the famous Magic Circle, and he has promoted companies and their products at Trade Shows throughout Europe and the UK. He has also been the resident magician at Manchester United since 2000. An unusual career choice for a graduate in Law with an MBA. His close-up wedding magic can be an ideal element for any wedding, his entertainment being a truly magical part of the day: setting guests at ease, whilst helping to create a fun atmosphere, and bringing something a little unusual and very memorable to the occasion. In terms of the social dynamics he helps to fill any gaps in the day (planned or unplanned! ), and is the perfect ice-breaker, bringing laughter and amazement to your guests of all ages. A full evening’s entertainment that’s ideal for a dinner with even just one table of guests. Your guests will be surprised by the unusual service that this magician (disguised as a waiter) provides. He subtly introduces a plausible yet eccentric combination of “Fawlty Towers” service and bumbling waitering that is guaranteed to get the guests talking. He bemuses guests with his harmless antics, and to their amusement introduces his amateur magical skills. These turn out to be peculiarly proficient, actually quite magical, and get everyone laughing. As dinner draws to a close and the coffee is served your guests will be most surprised to see their waiter is actually the after-dinner entertainment, and even more so when he starts by returning many of their belongings! (recently he started an after-dinner show by returning 4 watches, a phone, a pair of glasses and 2 ties – and he had returned numerous items already during the dinner!) His comedy and pickpocketing show then tops off dinner, making it a very unusual evening, full of entertainment, and an event that guests will laugh and talk about for a long time to come. Incidentally, he has even been booked by a company who heard the laughter from the room he was performing in. He even offers a money back guarantee if you aren’t thoroughly entertained.